Sometimes it seems as if fresh fruits, vegetables, and meats go bad in the blink of an eye. Consumers are left feeling frustrated, often turning to less expensive processed foods that last longer but are less nutritious. Now scientists report that they have developed a packaging film coated with clay nanotubes packed with an antibacterial essential oil. The film provides a one-two punch, preventing over-ripening and microbial growth, which could help improve the shelf life of perishables. People around the world have been trying to preserve fruits, vegetables, and meats since ancient times. From the traditional methods of salting or fermenting to the more modern methods of canning, freezing or wrapping in plastic films, food preservation has always been important. According to the U.S. Department of Agriculture, about 30 to 40 percent of the food that farmers produce in the country goes to waste. Sometimes, busy people just don’t have enough time to eat all of the fresh food they buy, but other times food spoils at the grocery store because consumers avoid purchasing imperfect fruits, vegetables, and meats. Over the past two decades, scientists have been developing alternative ways to preserve food, with an extensive focus on packaging. Numerous issues, primarily the versatility of the materials, have hindered progress. 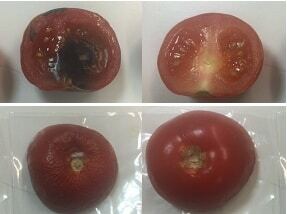 “While companies can already make many films that prevent fruit and vegetables from drying out, incorporating additional properties in the same film is a challenge,” says Ünal, who is at Sabanci University in Turkey. Bacterial contamination and permeability to both oxygen and water vapor are major issues that scientists are addressing. Another challenge is to prevent too much ethylene from building up around foods. Ethylene is a compound naturally released by fruits and vegetables that aids in the ripening process. But an excess of ethylene trapped underneath the packaging film can cause food to over ripen and rot. To meet the demand for multi-functional packaging, Ünal’s team started with a polyethylene film. To scavenge for ethylene and provide a gas barrier the group incorporated clay “halloysite nanotubes,” which are small, hollow cylinders. The nanotubes prevent oxygen from entering the film and prevent water vapor and other gases from escaping. In addition, they keep ethylene from building up by absorbing it. The researchers loaded these nanotubes with a natural antibacterial essential oil found in thyme and oregano called carvacrol and coated the inner surface of the packaging film with the loaded nanotubes to kill microbes. The team wrapped tomatoes, bananas, and chicken in the film to test its effectiveness over varying amounts of time compared to foods wrapped in plain polyethylene. After 10 days, tomatoes wrapped with the new film were better preserved than the control vegetables. In addition, the new film helped bananas stay more firm and keep their vibrant yellow color after six days compared to the control fruit. And chicken enveloped with the experimental film and refrigerated for 24 hours showed significantly less bacterial growth than chicken in plain polyethylene. But moving this technology to the industry will require some additional work, Ünal says. As the next step toward that, her team will test the new film to make sure it is safe and nontoxic. Ünal’s work was funded by the Scientific and Technological Research Council of Turkey. The American Chemical Society, the world’s largest scientific society, is a not-for-profit organization chartered by the U.S. Congress. ACS is a global leader in providing access to chemistry-related information and research through its multiple databases, peer-reviewed journals, and scientific conferences. ACS does not conduct research but publishes and publicizes peer-reviewed scientific studies. Its main offices are in Washington, D.C., and Columbus, Ohio. This technology is worth monitoring for a good business opportunity here in the Philippines.